HYDRAULIC BREAKER - WACKER 803 EXC. Hydraulic Breaker fits Wacker 803 Mini-excavator only. Provides 1,200 - 1,400 blows per minute. Intended for 4' to 6" concrete breakout, comparable to 90 lb air hammer. Includes plate adapter and hydraulic hoses with the universal "Flat-Face" fittings. Requires between 7.0 and 13.3 gpm hydraulic oil flow. Note; the operator must keep down pressure on the bit for proper operation. 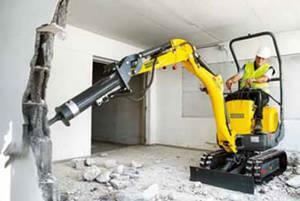 * Please call us with any questions about our hydraulic breaker wacker 803 exc. rentals in Oak Grove MO, Blue Springs MO, Independence MO, Lexington MO, Odessa MO, Independence MO and Western Missouri.